Grand gables and a barrel vaulted entrance with round columns lend dignity to this traditional, four-bedroom home with open floor plan for family living and entertaining. The great room with cathedral ceiling opens to the breakfast area and island kitchen. Both areas open to the large deck. Privately located downstairs is an impressive master suite with large walk-in closet and well-planned bath as well as a flexible bedroom/study. The center foyer minimizes wasted corridor space. Upstairs, two bedrooms with walk-in closets and cathedral ceilings share a third bath. A bonus room is located over the garage. 2nd Floor: 537 Sq. Ft. 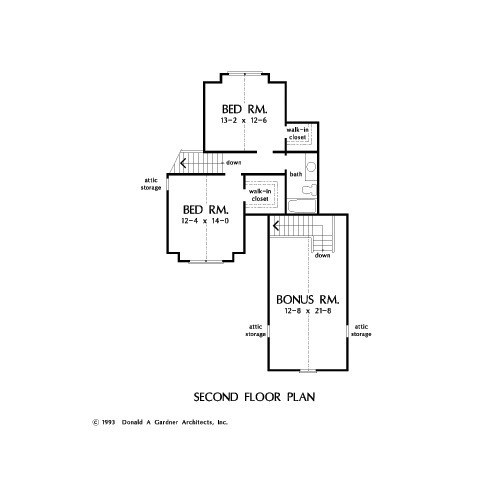 Bonus Room: 344 Sq. 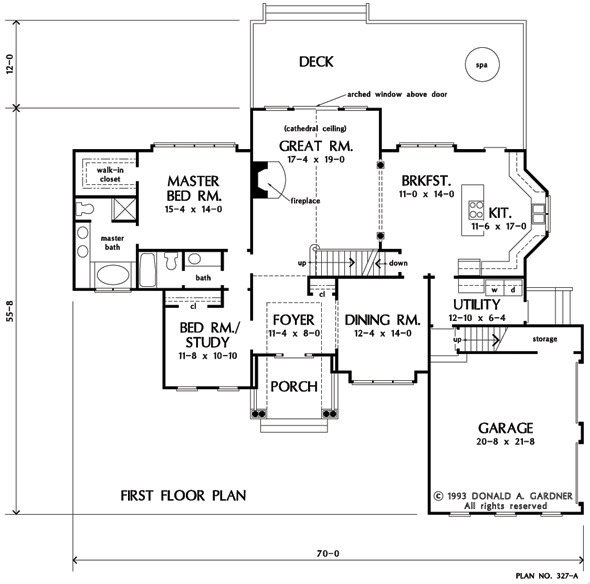 Ft.
House Dimensions: 70' 0" x 55' 10"
Porch - Right : 4' 0" x 5' 1" x 0' 0"
Storage (1st Fl.) : 9' 0" x 3' 4" x 0' 0"
Foyer (Vaulted): 11' 4" x 8' 0" x 11' 2"
Dining Room : 12' 4" x 14' 0" x 8' 0"
Great Room (Cathedral): 17' 4" x 19' 0" x 17' 8"
Kitchen : 11' 6" x 17' 0" x 8' 0"
Breakfast Room : 11' 0" x 14' 0" x 8' 0"
Utility Room : 12' 10" x 6' 4" x 8' 0"
Bonus Room (Vaulted): 12' 8" x 21' 8" x 8' 4"
Garage : 20' 8" x 21' 8" x 0' 0"
Master Bedroom : 15' 4" x 14' 0" x 8' 0"
Bedroom / Study : 11' 8" x 10' 10" x 8' 0"
Bedroom #2 (Cathedral): 12' 4" x 14' 0" x 12' 10"
Bedroom #3 (Cathedral): 13' 2" x 12' 6" x 13' 4"
Porch - Front : 12' 0" x 10' 7" x 0' 0"
Deck / Patio : 18' 0" x 11' 0" x 0' 0"